This Classic FM CD, released in May 2010, features Howard’s female choral group Enchanted Voices and The Tippett Quartet. The album is a collection of newly arranged Psalms, including “By The Waters Of Babylon”, and a new arrangement of his world famous “Psalm 23: The Lord Is My Shepherd”. 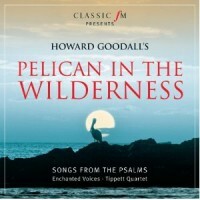 The title, Pelican in the Wilderness takes its name from a line in Psalm 102. The CD can be purchased via the Classic FM website here.